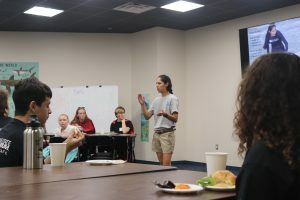 On October 29th, the Making Waves Teen STEM Café invited, Alyssa Barrett, the Wildlife Care Manager at the Texas State Aquarium Wildlife Rescue. Alyssa gave an excellent speech on sea turtle rescue. Aside from sea turtles, the center houses birds and sometimes even mammals like dolphins; although, thankfully that is rare. I say thankfully because every animal that they receive has been harmed and needs rehabilitation. Unfortunately, they house about 30 sea turtles on average which is more than any other type of animal they have. It’s sad because every kind of sea turtle is endangered. Without rescue facilities like the Aquarium’s, the world’s turtle population would quickly go extinct. There are many reasons a sea turtle can end up in a rescue facility. Alyssa described cold stunning, which last year brought in 1,200 turtle to their facility all at once. Sea turtles are reptiles, which means they can’t regulate their body temperature. When the water gets abnormally cold in Corpus Christi Bay, the functions of a sea turtle shut down and the animal floats on top of the water making them an easy target for predators. More reasons sea turtles come to the Wildlife Rescue Center include colliding with a boat, getting tangled in a net or fishing line, and a disease called FP (fibropapillomatosis). FP is a disease specific to sea turtles. Not much is known about this disease. It’s unknown how it’s transmitted, and it can be difficult to test on an endangered species like the sea turtle. What is known about FP is when a turtle has it, it grows nasty tumors on its body. If a tumor were to grow over the eyes or mouth, the turtle would not be able to see or eat and could die. 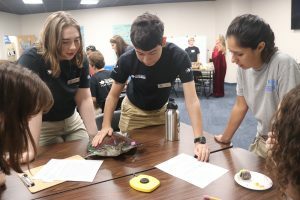 There is surgery to remove the tumors, but that’s about all a facility like Texas State Aquarium’s Wildlife Rescue can do for a turtles with FP. But with the heartbreak comes good news as Alyssa and her crew are able to rescue, rehabilitate, and release many turtles each and every year. For a moment we got to experience a little of what Alyssa’s job entails. 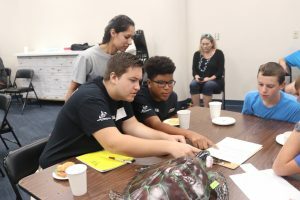 Every time they receive a sea turtle they have to fill out a form that asks questions like: What species is the turtle? Where was it found? Is it alive? and so on. We were given model turtles, each one with its own form that we got to fill out. We measured the carapace (the shell), we weighed the turtles, determined what was wrong with it, and filled in many other questions. It was lots of fun to figure out as a group what the characteristics of the turtles were.